Most of the cakes I make are a 2-4 day process. The final 2 days are always baking 2 nights before the party (so Friday for a Sunday cake) and then decorating on the day before the party (Saturday for a Sunday cake). 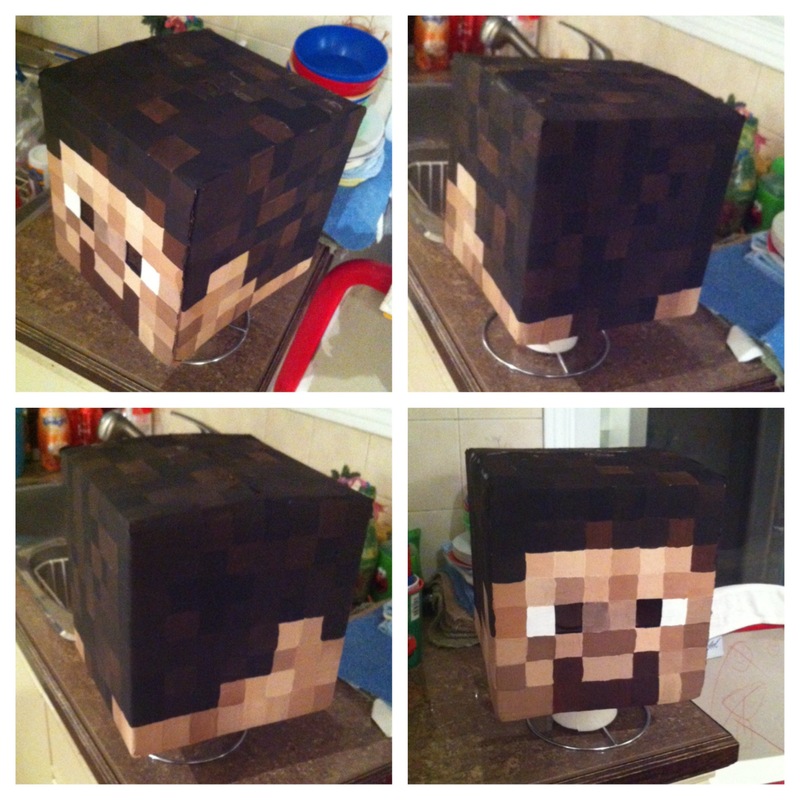 I add a few more days prior if I need to make fondant decorations or anything that requires drying time. This Pitfall cake, for as detailed as it looks, took 3 days. When I got home from work I prepared the base stand to get it to look like a brick wall with a cave by covering it with fondant and scribing a brick pattern to match one from the game. In the morning before leaving for work I gave the stand a quick wash of color. I needed to fill in the grout lines and give it time to dry before I got home. In a small cup I mixed together 1 drop of black Americolor food gel, 1 drop of brown gel, and 6 ml of water. I used a food-only paintbrush to apply the wash to the fondant, not aiming for any sort of pattern, and allowing the color to drip and run a bit before smoothing it around. I let it set for a minute or two then dabbed at it with a paper towel to remove areas of excess, and then used the same brush with only water to remove even more color. The goal was not to paint or finish the brickwork but to allow the dark color to seep into the etched lines and provide some aging. At this point it looks like a dark, muddy mess. When I got home from work I rushed to bake the 2 cakes I’d need. I knew I’d have plenty of time for them to cool before I planned to ice and decorate on Saturday, but I often use the oven for storing fondant bits overnight and didn’t want there to be any residual heat left inside it. When the cakes were cooled some I wrapped them in saran wrap to set aside for the night. Then I prepared the table for getting down to some fondant painting. These are the supplies I prepared: in the lid of my color box are a smaller box of Americolor icing colors and a bottle of Wilton White-White, then the contents of the case itself is my collection of Wilton icing gels and some regular, grocery-store-type food coloring. I brought down some cotton balls thinking I might use them for blotting, but testing on a scrap of fondant revealed it stuck terribly to the wet sweet, and I quickly got rid of them. I’ve got a measuring cup of water for rinsing my brushes, a small cup of water and syringe for adding clean water to my colors if I need to thin them any (the syringe gives you way more precision when working with tiny amounts of color than dropping by spoonful or pouring), and a small cup of the leftover dark wash from the morning that I’d kept moist in a tupperware for the day. I’ve got a few sizes of food-safe paintbrushes and some paper towels for blotting, and finally at the bottom is my standard palette, left over from an old pack of hors d’oeuvres. That’s the palette I use most often, and it works great with larger quantities of color, like when tinting icing sugar/water for the fondant toppers I make. However when using tiny bits and blending a lot of shades I find it’s not as practical, and I eventually switched over to an artist’s style palette with small dabs of the gel colors on it, and a small styrofoam tray for blending. The colors bead up on the tray so I don’t lose any to absorption. I prepared the stand by putting it on my lazy susan, a wooden one from Ikea. I’ve also got a glass one and a plastic Betty Crocker one, both from the dollar store, but this one is the one I always reach for. I stuck a tub of icing in there to help weigh it down. 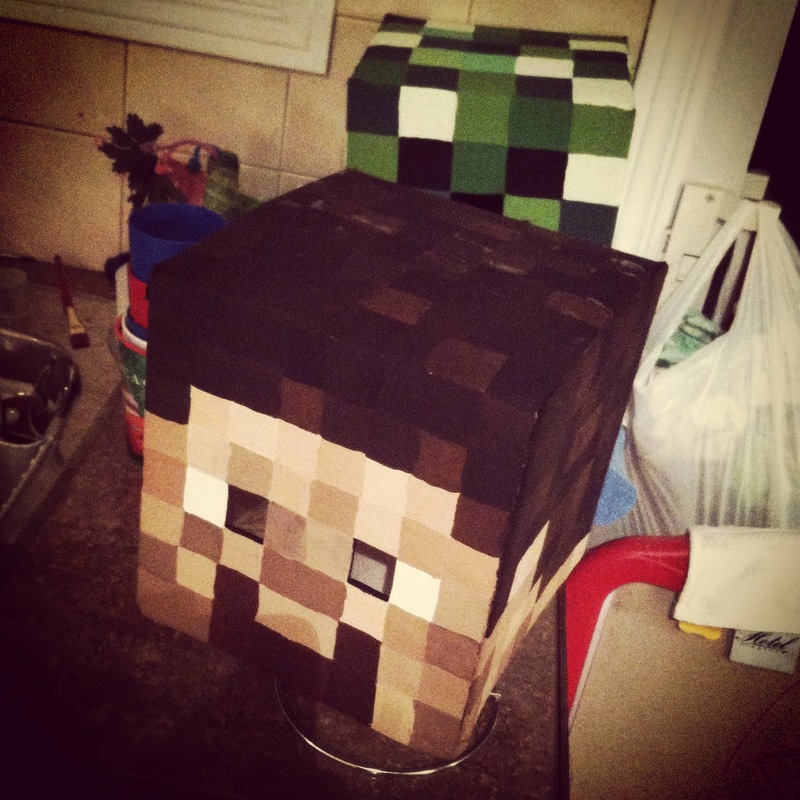 The stand is pretty heavy, especially with the fondant, but that was a precaution. Now that I had the general shape scribed in and the darker grout lines, I needed to lighten the bricks to a faded, creamy, beige-ish color. I began to mix up a color, testing on the paper towel until I had something that looked right. You can see at the bottom of this next pic where I’d tried out a color that was too pale, and I had to darken it up a bit. In the end I used some Wilton White-White as a base, then some brown and black Wilton gel colors, a touch of Wilton lemon yellow, and some of the morning’s dark wash water to thin it out. I painted small dabs of the resulting mix onto each brick individually, blending and smoothing until I got rid of the brush strokes and had something that looked like an old brick wall. After the back was done I moved on to the front. The small amount of mixed color that you saw in the video was enough to paint the entire back and front. The next step was to add some greenery. I knew I’d have a lot of grass and vines and leaves in the cake, but wanted to add more depth to the bricks so I used more of the dark wash and deepened it up with Wilton gels (leaf green I think). I used a messy brush to pounce the color in areas where moss would grow, mostly around the bottom of the back piece and around the top and sides of the front. This is a great reason to keep those brushes that get all messed up, so you don’t ruin good ones! As I added the moss I made sure to keep the brush from being too wet – the effect was supposed to be subtle – and I also periodically touched my brush in different areas of the mix where I hadn’t fully blended, sometimes picking up straight gel from the edge of the palette. This gave me varying shades of green and a more natural look. Finally I used some White-White and Americolor black and a touch of brown to get a nice varying gray shade for the rock cave. Again I resisted the urge to overmix the color, so I could get depth to the wall. Sometimes I touched in a bit more white, which lightened the grays, and then I’d go back in with a more liquid black, getting into the cracks. Here’s the finished support, set aside for the night. The front (above) and the back (below). Categories: Food, Nerdy, Technique, Tutorials, Videos, WIP | Tags: activision, birthdays, cakes, Henri, how to make an old brick wall out of fondant, how-to, Pitfall Harry, Pitfall: The Lost Expedition, Pitfall: the Lost Expedition cake, video game cakes | Permalink. For Henri’s 7th birthday party he wants a Pitfall cake. As in Pitfall: The Lost Expedition. As in the old PS2 game all 4 of us at home play, and love. This gave me a bit of a challenge. The most iconic visuals from Pitfall are, well, the pits. And Pitfall Harry swinging on vines. Pits would be easy enough to make, but vine-swinging? Hmm. This required a think. My first thought was to make a framework that would go over the cake with vines and a little fondant Harry hanging down, but while I poked around at work, looking at unused frame displays, a new idea struck. I found a 2-level display that got my creative juices flowing. In order to plan properly (and avoid scale mishaps like in the Diego & Dora cake) I took iPhone pics from a few angles and then printed them out really pale, so I could sketch over them and have a rough idea of what I wanted to do. First I sketched my plan onto paper. You can sort of see in the first image that I have a brick wall with a balcony-like upper tier. The blue overhang is supposed to be a waterfall that flows down onto the cake below, and it’s not easy to see unless you click, but there’s a healing spring/fountain hidden behind the waterfall. Once happy with the sketch I needed to see if it would work, conceivably, and so I used some scrap paper and made a quick mock-up of where the actual cakes would go. There’s one layer of cake on the top tier, the ‘waterfall’ hanging down, and then a layer of cake the same height as the bottom tier, butted right up against it. Okay… maybe there’s something here. This was Thursday, and his party would be on the upcoming Sunday afternoon, so I knew I had to get started right away. After work I stopped at a bulk candy store for supplies like green sprinkles and extra fondant. I also picked up 2 cake boards. I usually use trays for my cakes but I didn’t know how well the stand would fit and I didn’t want to be limited by side edges. I bought 2 so I could ‘glue’ them together with icing, as I didn’t think 1 board would be strong enough to support the heavy cake. Here’s the same paper mock-up at home, on the actual cake boards so I could test for fit. What I was hoping for, and am happy about, is that the board is long enough for me to extend the lower cake section beyond the paper template. I plan to have crocodiles in the water but hope for room to put a pit as well, and I think this will give me enough. Next I cleaned the display stand and wrapped it in saran wrap, and used duct tape to block off the two open edges. I also cut 2 cardboard ovals to fit over the tiers, as they have large cut outs where the products are meant to sit. The top one will be used as a cake board, and the lower one will merely be covered in icing. …and then trimmed it to size. At this point I realized that even dampened, the fondant did not want to stick to the saran, and I removed all the coverings. D’oh. I make the mistakes, so you don’t have to. Water-dampened fondant DID want to stick to the clean plastic stand just fine, luckily, and I covered the back with the large sheet, smoothing it down well against the back and around the edges, blending it out with my fingers. I did the same for the larger areas of the front as well, and then carefully wrapped one thick-ish piece around the open edge of the upper tier, smoothing it into place above and below while being VERY careful to not tear through the open front. Once the fondant was secure I used a scoring tool to scribe a brick pattern into the fondant. I had to be careful to not pierce the open-fronted balcony edge, but for the rest it was all flush against the thick plastic, and I could press pretty hard if I needed. I did the back first, then copied the dimensions over onto the front. For the lower tier, I wanted it to look more like a cave than a brick wall, so I wet the fondant and pressed on little pieces with my fingers, smoothing and adding more until I had something that resembled a natural rocky wall. I also used the same beige fondant to cut out shapes to let harden. On the left are a sleeping croc for in the water, round pieces and a tiki head for the healing spring, and a croc’s open mouth with poor Harry struggling to break free. (Or, what I HOPE will look like that eventually). I tinted my remaining beige into a few shades of green and used a leaf-press cutter to punch out 2 sizes of leaves, which I set over the edge of a Styrofoam food tray (saved from buying vegetables) to dry. I also cut a few strands of tall grass but I’m not sure if I’ll end up using them. At this point it was about 1am and I set everything aside to dry by the dehumidifier and went to bed, knowing the next few nights would probably be pretty late ones to get everything done in time. Categories: Food, Nerdy, Technique, Tutorials, WIP | Tags: activision, birthdays, cakes, Henri, how to make an old brick wall out of fondant, how-to, Pitfall Harry, Pitfall: The Lost Expedition, Pitfall: the Lost Expedition cake, video game cakes | Permalink. It’s October! That means it’s okay to start talking about Halloween, right? ‘Almost’ is relative. (He clearly gets his awareness of time from his father). However his mention of it reminded me that I never showed last year’s costume. So. 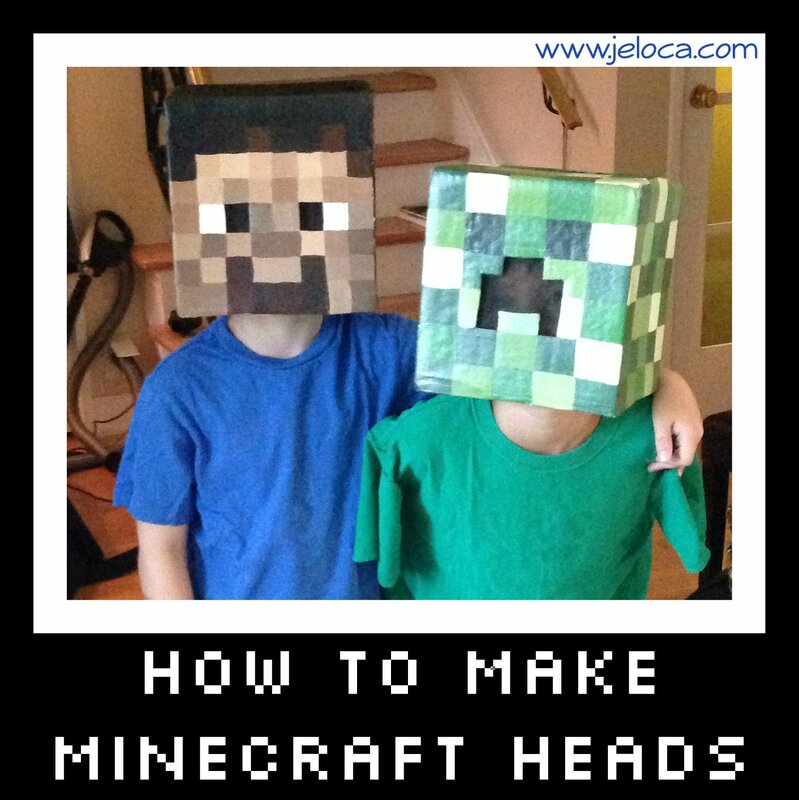 Now, with plenty of time to get ready for this year’s holiday… here’s how I made the boys Minecraft Steve and Creeper heads, and how you can too! 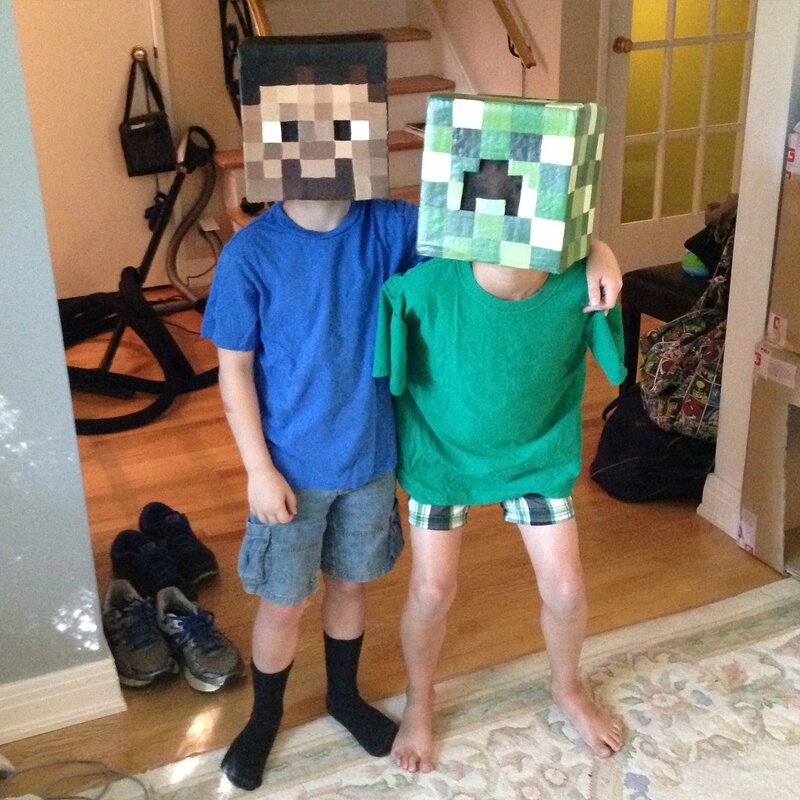 The boys decided for Halloween they wanted to dress up as their favorite Minecraft characters. 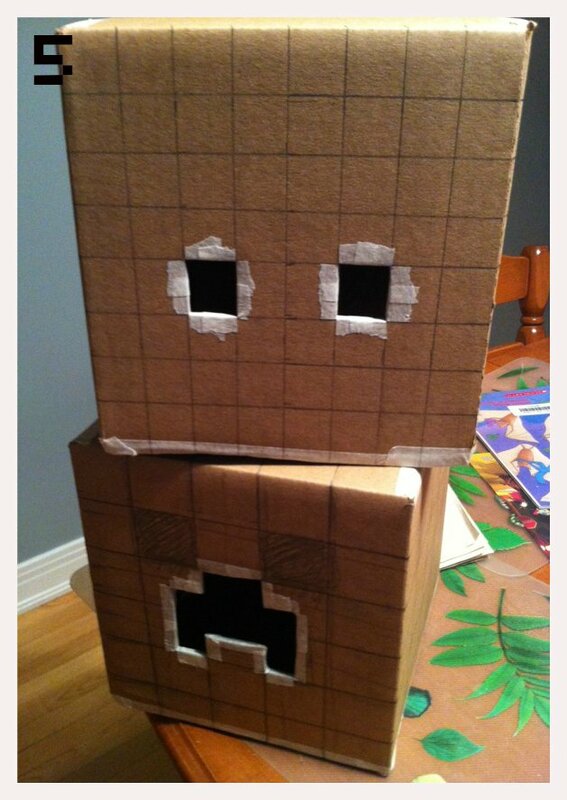 They do sell ready-made cardboard heads in stores but they are expensive, and there are a ton of tutorials online. I looked at a few, then worked things out with what I had on hand, and what I was able to find at the dollar store. 1. Yannick came home with 2 small boxes he’d found somewhere. 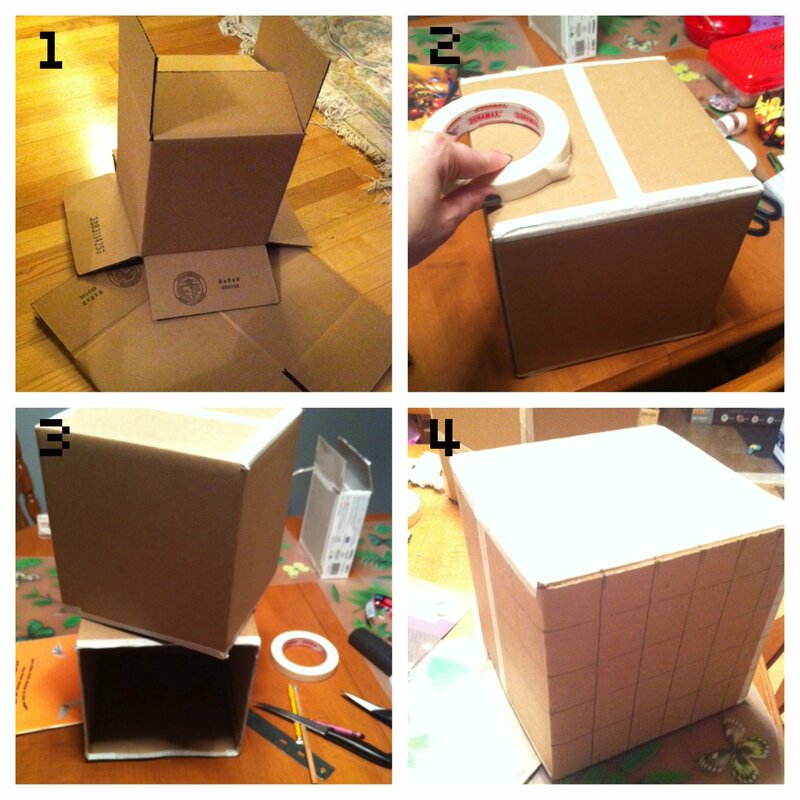 Grocery stores often have ones you can ask for, or as a last resort you can buy boxes. 2. I used two-sided tape to tape the outer flaps to the inner ones (not shown) so the inner flaps wouldn’t drop down onto the kids’ heads. Then I used masking tape to fully tape over the top seam, both to securely close one end of the box, and to make the seams less visible once they were painted. 3. I cut the lower flaps off the boxes and then used the same masking tape to cover the exposed edges. It would gave a cleaner look, vs the rough look of cut corrugated cardboard, plus was less likely to catch and tear, which could potentially pull off the paint. 4. I divided the 4 sides and top into even grids. I looked at pictures of the characters online and mapped out roughly how many squares per color/face, and then used a ruler to divide the front (face side) into the grid. Once the face was set, I carried the markings around the sides of the boxes, and finally the top. Because the boxes are taller than wide, the top has fewer squares than the sides do. 5. Once the boxes were plotted I used an cutting blade (also from the dollar store) to slice out the eyehole sections. For Steve, only the dark pupil area was cut out. 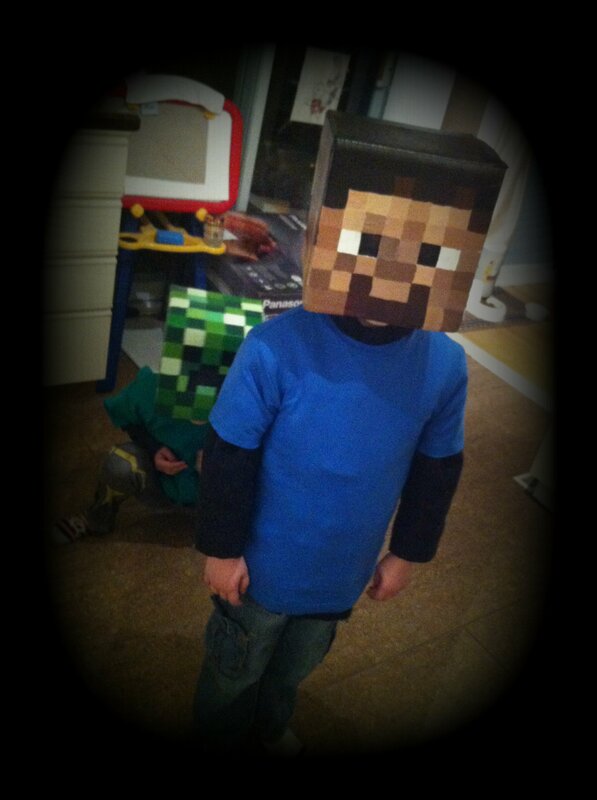 For the Creeper it made more sense with where Henri’s face was to cut out the larger nose/mouth section. After removing those areas I covered the exposed edges with masking tape. 6. Finally it was time to start painting. The paints and brushes were from – you guessed it – the dollar store. 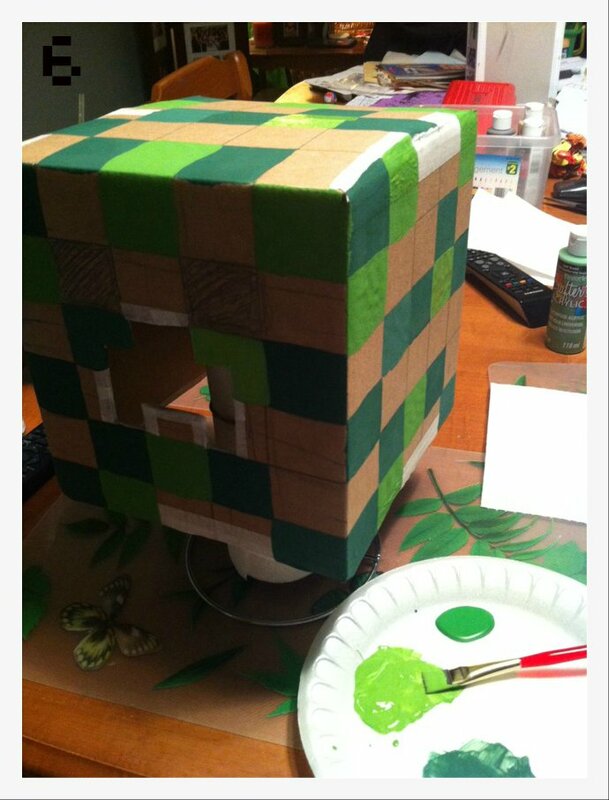 The advantage with the Minecraft characters is that if you have to custom mix your paints to get the right colors, it doesn’t matter as much as it would in most projects if you have enough to complete your painting or if you need to mix more and risk not matching quite right. The goal is to have an assortment of shades, so blending colors works perfectly. 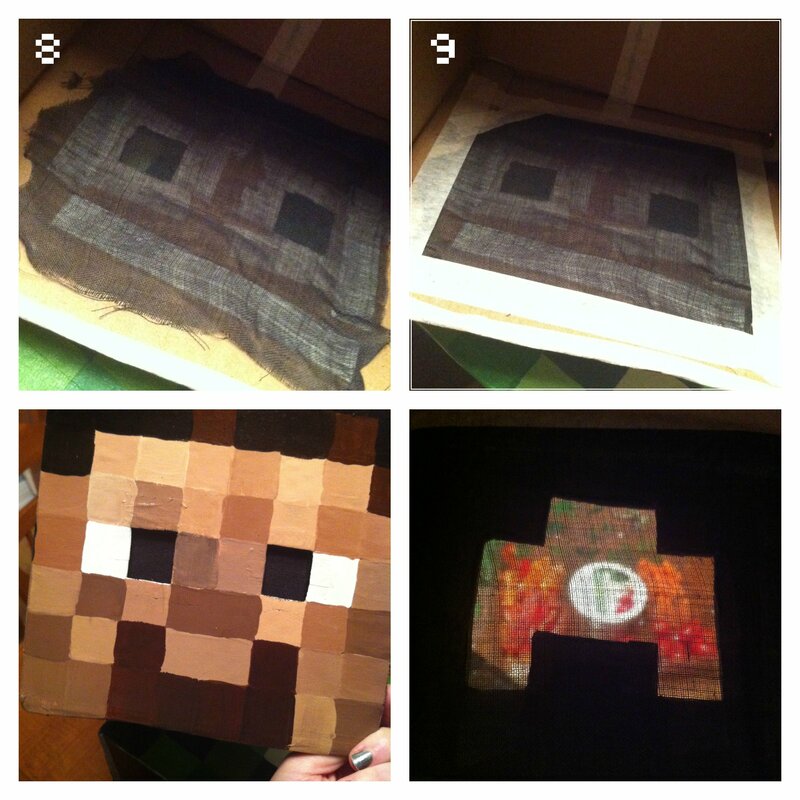 Here’s the four sides of the painted Creeper head. I set the boxes to dry on a paper towel roll to hold them off my counter until the lower edge was dry. (I held them up the same way while painting too). I had them both on the counter while I cleaned up the dining room table of all my painting gear. Couldn’t resist this shot. Look out! He’s behind you! 7. The next step was to seal the heads with an aerosol can of clear sealant. I didn’t know what the weather would be like on Halloween and didn’t relish the idea of my hard work being ruined by a few drops of rain or thick snow settling on the kids’ heads. I moved the heads into the garage and set them on some newspaper to protect the floor as I sprayed, and did a few coats, allowing each one to dry for about 20 minutes in between. If you have a dry, open area outside or good, even weather you could do this next step outside, but here there was nowhere I could leave them unattended, so I had my garage door open the entire time I sprayed, and then left it about a foot open during the drying time between coats. Once they were properly sealed and dry to the touch I brought them inside and allowed them to dry for a full day before the final steps. The last bit in getting the masks ready to wear was to block out the open areas. I bought a gauzy sheer black scarf (also at the dollar store!) and cut off squares large enough to fully cover the open areas. 8. Using the same double-sided tape I secured the black fabric down around the cut areas. 9. Finally I covered all the exposed edges of the cloth with masking tape, making it doubly secure and hiding any rough, cut edges so they wouldn’t catch or fray. With that, the masks were complete! The black gauzy fabric looks opaque from the outside but from the inside it’s so sheer that it’s quite easy to see through it, making it perfect for this project. From idea to finished product this project took about 4 days. Halloween was on a Friday last year and Yannick brought me home the boxes on Monday night. Tuesday I did everything up to/including painting. On Wednesday night I sprayed the clear coat, and then on Thursday night I stuck the black fabric in. They were pretty darn excited! 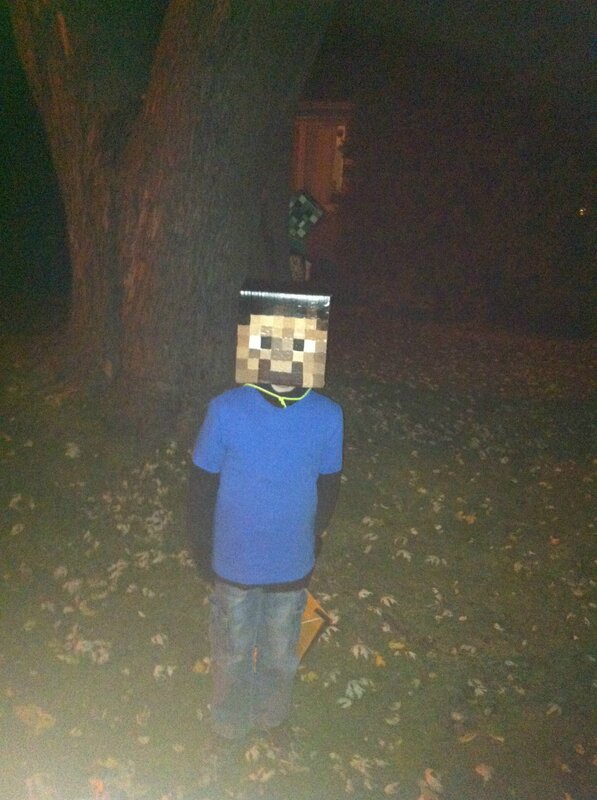 …then it was time to go trick-or-treating. Can’t you almost hear the tick…tick…tick…BOOM? The heads held up beautifully and the boys felt like mini celebrities as they walked down the street and people from all over, even in passing cars, yelled out “Steve!” and “Creeper!” and gave them high-fives. The heads have now become part of our dress-up box and are still in great condition, and they wore them for ‘Halloween Day’ at their camp this summer. 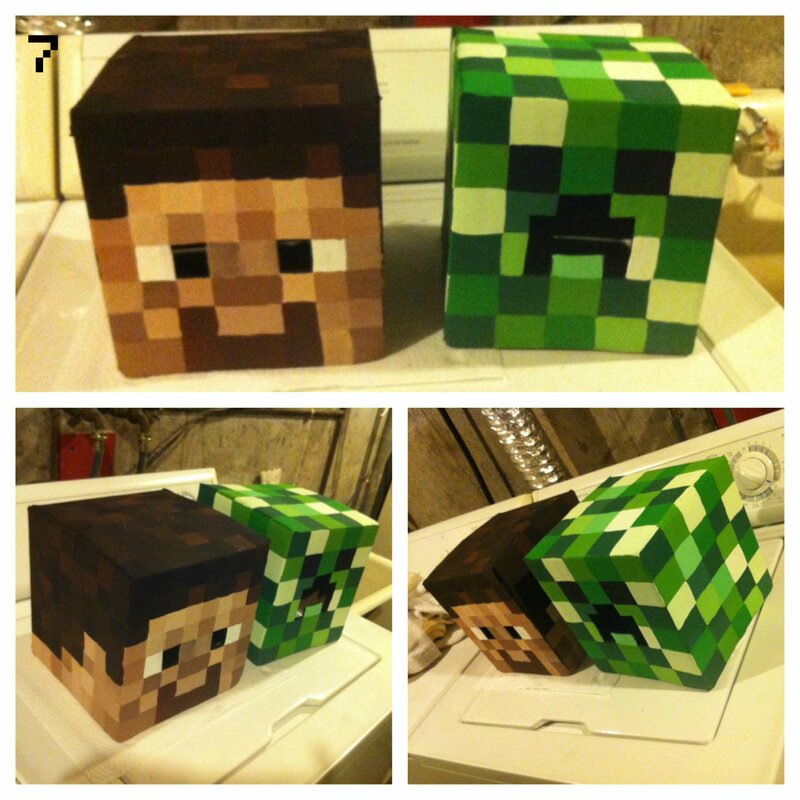 I hope this post shows you how easy and fast it can be to make your own Minecraft Steve and Creeper heads! 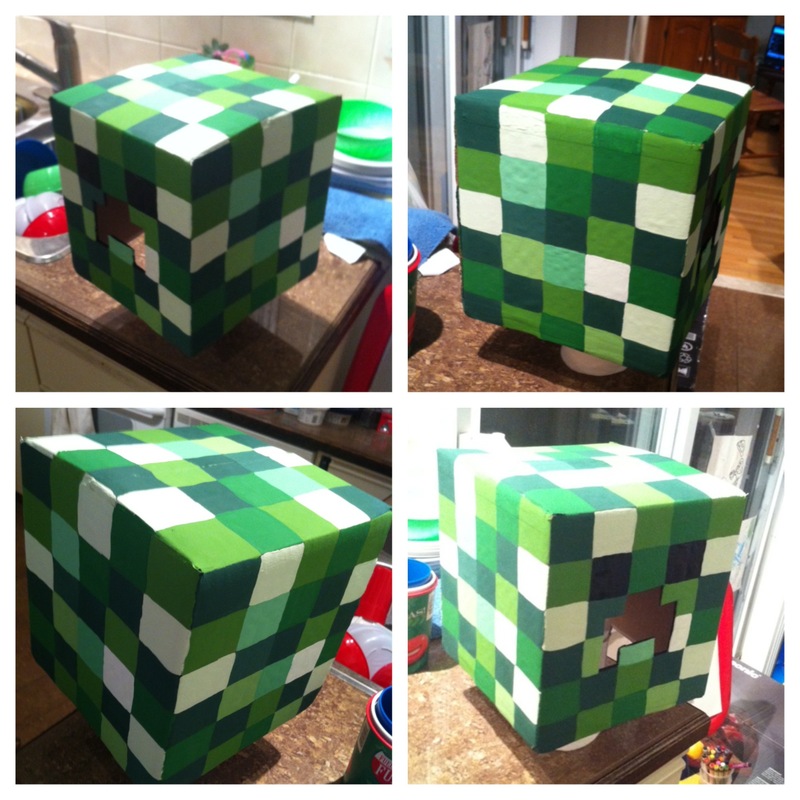 Categories: Crafts, Nerdy, Tutorials, Videos | Tags: cosplay, costume, Creeper, DIY, easy and fast kid costume diy, halloween, how-to, Minecraft, Minecraft Steve, Steve | Permalink.